Patch of the Day - Bugfest! A 10 minute modular jam to close the month. Everybody modulated everybody else. Enjoy! A quick update to yesterday's Patch of the Day - Los Comparadores - pressing Doepfer's A-137-2 Wave Multiplier into event timing duties à la Plan B Model 17. I mailed Dieter Doepfer to ask him whether a modification was possible to allow access to the individual outs of the A-137-2. He pointed me in the direction of this PDF of the module's PCB. I Should have read the product description properly! According to the website, an expander module is in planning and will go into production if there is enough demand. 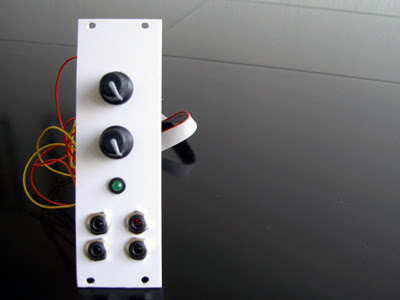 This could provide access to the pulse and saw outputs of each stage as well as toggle switches to take any one of the outputs out of the mix. The left channel is the original timing pulse from a ramp LFO, the right is the shifted ramp. Keeping the input level to about 3, the useful delay range seems to be about from 3 to 7. Not bad considering it wasn't intended for this purpose! Abusing Doepfer's A-137-2 Wave Multiplier as a quad comparator and event timer. This had me laughing my head off: the results are just too unpredictable and the patch needs some explaining. I'm currently attempting to build a quad event timer along the lines of Plan B's Model 17 Triple Event Timer and have so far bread-boarded a working dual comparator using an LM339. This works quite nicely, but is not ideal. Taking a break and looking for an alternative (read: quick, cheap fix. I'm lazy, right?) I realized my A-137-2 Wave Multiplier is itself a quad comparator. Happily it will accept a DC input, output triggers of a sort and the threshold levels are voltage controllable. Unfortunately it only has a mix out but I overcame this by using a sequential switch to feed a trigger to each envelope generator. Bananalogue VCS paces the A-137-2, A-137-2 mix out to A-151 sequential switch, +5V to its common input is fed to each of the A-143-1 Complex EG's four envelope generators, individual outs to a Cwejman VCA-4MX gating four VCOs, mix out to a CGS52 Lockhart Wave Folder and on to a VCA-2P for panning which is controlled by the mix out of the A-143-1. Still with me? I then took two LFOs (positive and inverted) and patched them to the CV ins of the A-137-2 to modulate the timing of the events. Two oddities about using the A-137-2 for this sort of application: it's totally imprecise and the input level of the pacing CV has an effect on the timing. You can hear this in the first thirty seconds, where all I am doing is changing the input level. The Lockhart really made this patch for me: when the spacing between events is tight, in effect producing a chord, the wave folder churns out a lovely clangorous noise. While not as precise as the M17, it's close enough for Rock 'n' Roll and, if it saves me from the soldering iron, then it'll do for now! A wee tribute to Robert Burns on his 250th Birthday - Have a good one! Created with Logic8 soft synths (apart from the 'pipes, of course). Finally got round to compiling and uploading this test! Livewire's AFG goes head-to-head with Cwejman's VCO-6, two similarly priced and spec'd high-end VCOs. They both sound great, but do you need both? Download the tests here (18 MB) and here (8 MB). Thanks to Schneidersbuero for the loan of the VCO-6! This patch was inspired by the Plan B Triple Event Timer and marks a bit of a departure for me: it was realized using the Clavia Nord Modular 2 Demo. I tried the M17 years ago but couldn't get my head round it at the time. However, my last PotD featuring the A-143-1 showed the limitations of using fixed comparator timing/ threshold levels. The spacing between events is always absolute, rather than relative. I tried Doepfer's A-167 Comparator, which is a fine module and actually more flexible than a single M17 output. However, to emulate the functions of the TET, you'd need three of them. Before building my own quad comparator using Ian Fritz's LM339 design, I wanted to try out the musical applications of such a module and that's where the NMG2 came in. I used a VC ramp to determine the timing/ spacing of the four events and fed the EG with a negative pitch CV. As you can hear, the result is similar to the effect of a sampled phrase: the relative spacing remains intact despite the change in speed/ pitch. Here is the NMG2 patch. Basic run-through, unaffected signal first. I know I swore I'd never go near a soldering iron again after building the Trobetronic40 but, encouraged by Paul at Schneidersbuero and 'Roter Agent' at the sequencer.de forum, I gave it another go. Cheers lads! Added an extra attenuator and cap and an LED cos we all love blinkies, right? 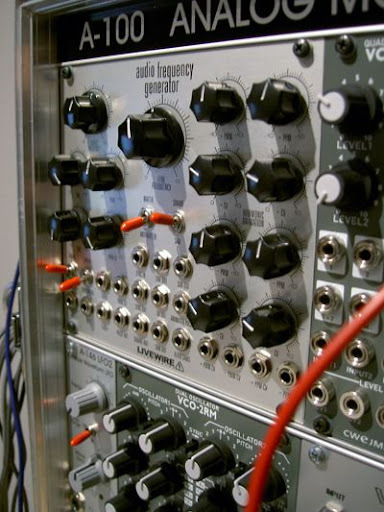 The star of today's PotD is Doepfer's A-143-1 Complex Envelope Generator. Supporting roles played by a Sequentix P3, Kenton Pro 2000, 4 VCOs and Cwejman's VCA-4MX. I've used the A-143-1 to create a ripple effect. Each 'note on' triggers a succession of four envelopes which are patched to the four inputs of the VCA-4MX. By changing the Threshold level, the timing of the ripple is affected. This effect can be further pronounced by changing the A/D times of the envelopes. The P3 generates a four note sequence which is transposed using an accumulator in bi-polar mode. The Kenton is set to polyphonic mode, so that each new note is sent to the next VCO in the chain, adding a slight 'analogue shift register' feel to the patch. Another P3 driven track featuring four elements: VCO-2RM cross-modded and 'thwapped' by a VCS to a Model 13 LPG and gated by an A-143-1, AFG FM'd by an A-105, MMF-1 dual sine pinged & VC'd and some white noise sweeps.